Saturday will not be Town’s most famous son Jamie Vardy’s first return to Fleetwood. The forward returned soon after his £1m move to Leicester City to fulfil his promise to then Town boss Micky Mellon, pulling up outside the manager’s portable office and pipping the horn of his new Range Rover. While Vardy might have left his non-league roots behind in 2012 he still holds the club in high affection for taking a gamble that has since led to a Premier League medal and England caps. But Vardy has not forgotten Town and that 2011-12 Conference promotion winning season– and though his trophy cabinet might be racked full of glittering medals, he still has not managed to get that season’s end-of-season trophies from Jamie Maguire. Now, he is preparing for an official return as his Leicester side will become the first Premier League side Town have faced competitively on Saturday. He’s certainly going for the win but, if he shakes off a groin problem to play, there will be one more memento he wants to take from Town. While he may not have those 2011/12 awards, he wants to leave Highbury with victory and Town skipper Nathan Pond’s shirt at full-time. Vardy’s story might be engraved in English folklore but Pond’s is just as impressive. 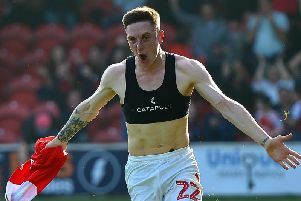 While Vardy went from the factory floor to the European Championships in less than a decade, Pond has gone from the North West Counties to League One, all with the same club. It is a feat that is unequalled, with Pond a Guinness World Record holder for his six promotions. For Vardy, Pond’s shirt will mean a lot and he says that season will always hold a place in his heart. He said: “(With Pondy) It is the same as what it was when we were team-mates. “We always kept in touch, he got a quick message in asking if we can swap shirts and I will definitely be doing that. “We all talk quite regularly, it is good to keep in touch, everyone has gone their separate ways but we are still the same people. “It is still massively up there, it was my first shot at full-time football and to go on like I did that season and the success we had was the first part of me and what I achieved. Another face that Vardy is looking forward to seeing is kit man Danny Moore, who famously helped him dye his Mohican red at one stage in that epic season. He said: “It will be good to see a few old faces, the majority of the team have moved on but some of the backroom staff and the kit man (Danny) are still the same. “I can’t believe Danny is only the kit man now because he used to be the physio, masseuse, you name it he did it! “It will be a special occasion for me personally but I also know that as soon as you step over the lines we want to be winning and getting our name into round four of the hat. Vardy lived with Rob Atkinson, Peter Till and Junior Brown in Thornton during that season. He was part of Town’s first appearance in the third round of the FA Cup though his preparation for that night will be much different than it was prior to their clash with the then Championship side Blackpool in 2012. The players’ house was burgled overnight and Town were robbed on the pitch with a 5-1 scoreline flattering their visitors. That goal came from who else but Vardy – and it was to put him on the map prior to his big money summer move. It was Blackpool boss Ian Holloway who first touted that £1m figure and, given that the cup put him on the big stage, Vardy holds the competition in high esteem. He said: “It does I think; obviously from previous years, especially the one at Fleetwood where you are a Conference team getting to play against a league team and having a chance to have a crack at them and showing what you are capable of and that you are up to the test. “We had Wycombe in the first round and it was all league teams, beating Wycombe and then going to a replay at Yeovil, obviously unfortunately losing 5-1 to Blackpool but it was great putting yourselves up against those players and teams. “The game against Blackpool was a derby. “On a personal note getting on the scoresheet and giving some quality players a hard time that day. “After the game it was Ian Holloway who came out and mentioned the £1m and then that was it.